Daphne Foster is a substitute teacher stuck in an English class, waiting for that dreaded parent-teacher conference. With much preparation and anxiety, she encounters the unforgettable Charlie Cross. His charm and good looks, win her over but rumors of his involvement with organized crime make his continued disappearances disturbing. In walks Heathcliff Vanderpool, creating a love triangle of unusual sorts. Unknown to Daphne, Heathcliff and Charlie are old friends: Older than she could have imagined. With Charlie away on business, Daphne and Heathcliff discover a passion between them lying beneath the surface. As their souls link, pulling away from Charlie becomes next to impossible. Will his involvement in organized crime consume them both before she’s able to get free? When you become “linked,” the choice may not be your own. “I think we’re passed the formalities now, don’t you?” I asked. “Or maybe a warm sensation,” he whispered, putting his finger on my face and tracing it down to my lips. I swallowed hard and I know my face was yet again bright red. I looked over at Janice who was having a pleasant conversation with his brother. Then I looked back at him. “Does your wife know you frequent schools to pick up teachers?” I asked. The waitress showed up with four shots of tequila. I looked at him in amazement. “Really?” I asked. “Come on, Daphne, let go a little,” Janice added, shining like a brand new diamond. We downed the shots and Charlie got a little too close. “I find you irresistible, Daphne.” He leaned in so that he was almost whispering in my ear. “I don’t know what it is about you, but I must have you.” He took my hand and brought it to his cheek. “What is it that you do, Mr. Cross?” I asked. “Not into my arms, necessarily,” he answered. “But certainly into my bed." Judy Serrano graduated from Texas A&M University, Commerce with a BA in English. She is the owner of Make Cents Editing Service, and is an adjunct professor at a local college. She is a freelance writer for certain on-line publications and writes romantic suspense and paranormal romance novels. 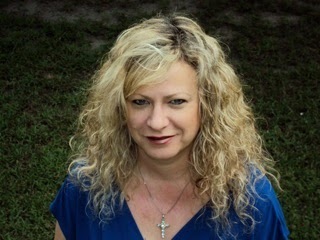 She is the author of The Easter’s Lilly Series, the Linked Series, and Ivy Vines, Visions. Although she is originally from New York, she currently resides in Texas with her husband, four children, (all boys) and five dogs. She is also a singer/songwriter in her spare time. Book sounds very intriguing. Will definitely be adding to my TBR. I like Charlie's attitude in the excerpt.